Watching Crocodile Dundee 2 this Christmas (I’m that cool), it dawned on me just how stylish Mick’s missus, Sue Charlton, played by real-life wife Linda Kozlowski, was in her nifty 40's-style fitted suits and chic ‘safari’ outfits. 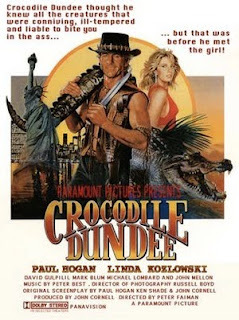 Sue’s outfits in the original Crocodile Dundee film were just as timeless (barring the heinous black thong-back swimsuit, which, despite being an atrocity in itself, she actually carried off and even suited! ), her daring red bodycon dress being the stand-out piece. In the sequel, her black, nip-waisted skirt suit, white jacket worn with Veronica Lake waved hair, and especially, her Doctor Quin-esque Australian outback outfit of white linen shirt, flared skirt and twisted leather braces were all timelessly stylish, and this was 1988! You’d be hard-pressed to find many film outfits from the 1980's that look anything resembling 'acceptable', let alone 'good' 22 years later. It makes me wonder if Linda styled herself. While we’re wandering down memory lane, check out this wonderfully sexist film poster from back in the day. Even her cartoon persona looks hot! ha! I bloody love crocodile dundee and love an unexpected style icon even more. Mine is Marlene from Only Fools and Horses.